Is your Mozilla Firefox browser running too slow? Are you encountering issues with Firefox? Want to make the Firefox run like new again? 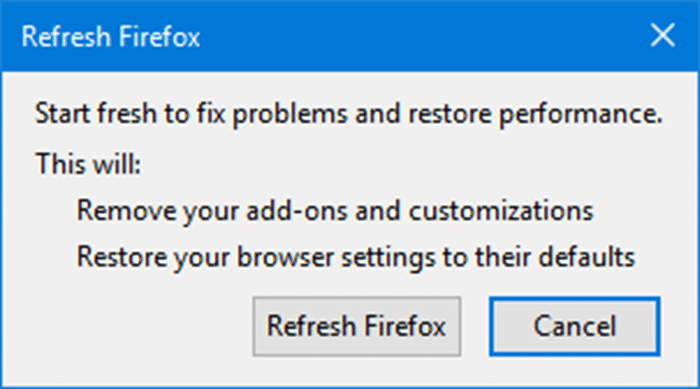 Want to repair Firefox without reinstalling? In this guide, we will see how to fix all Firefox issues by refreshing it. 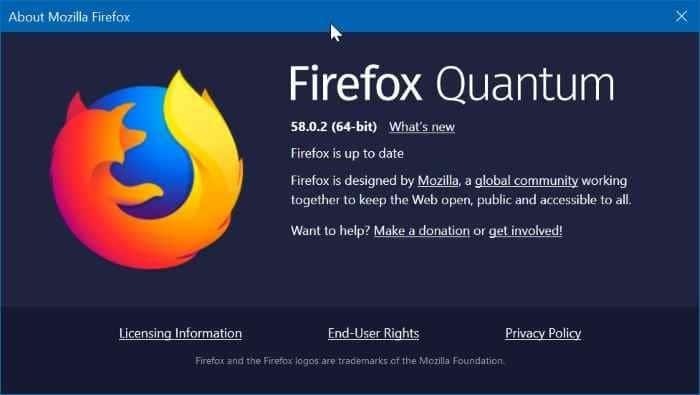 There is a built-in Refresh Firefox feature present Mozilla Firefox browser to help users to fix Firefox issues without losing data. The Refresh Firefox restores Firefox to its default state without deleting your important data such as open tabs, history, passwords, and bookmarks. However, the Refresh Firefox feature removes all installed extensions and extension data. 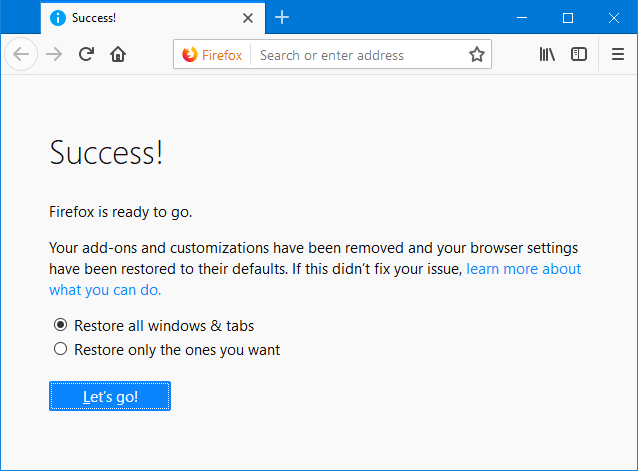 However, the Refresh Firefox exercise will remove extensions, themes, website permissions, toolbar customizations, added search engines, modified preferences, user styles, download actions, security certificate, DOM storage, social features, and plugin settings. 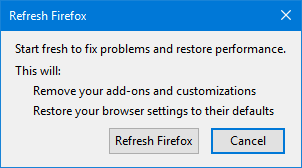 Following are the two ways to refresh Firefox browser to resolve all issues. Step 1: Open the Firefox browser. On the new tab page, type about:support and then press Enter key to open Troubleshooting Information page. 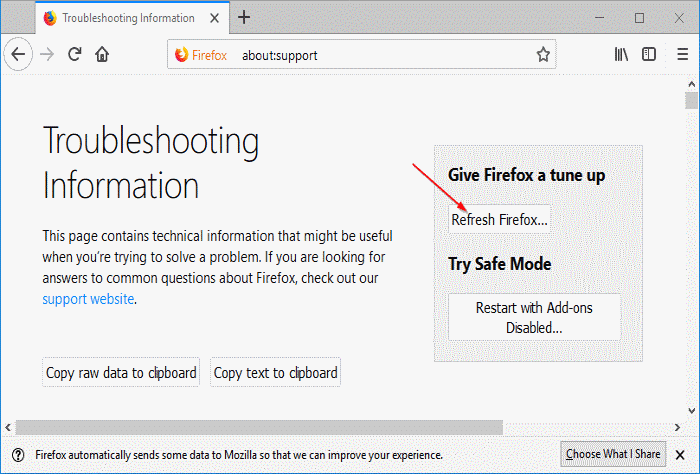 Step 2: Here, in the Give Firefox a tune up section, click Refresh Firefox button. Step 3: When you see the confirmation dialog, click Refresh Firefox button to begin the refresh job. It job will be finished in a few seconds! Step 4: Once done, you will see the following page with Restore all windows & tabs and Restore only the ones you want to open. Select the first option and then click Let’s go! You have successfully refreshed your Firefox browser. 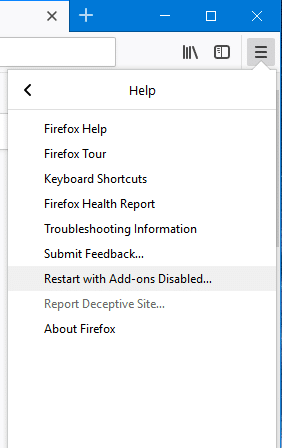 Step 1: In the Firefox browser window, click the menu icon (refer to the picture below), click Help, and then click Restart with Add-ons Disabled option. When you see the confirmation dialog, click Restart button. Step 2: Firefox browser will close now. You will soon see the following dialog with Start in Safe Mode and Refresh Firefox options. Click Refresh Firefox button. Step 3: When you get the confirmation dialog, click Refresh Firefox button to begin resetting Firefox to its default state. Step 4: Once done, you will see the following screen where you need to simply click Let’s go button to restore all open tabs and windows again to start where you left off. Simple as that! You might also like to read our how to manually backup Firefox passwords in Windows 10 guide.